Avan Yazad is the female deity presiding over waters. Zarathushtis worship the divine element in all physical objects. The physical water on earth contains invisible divine light or energy, which are the blessings of Ahura Mazda. This energy is more prevalent in the flowing water of rivers, oceans, streams and springs. Thus, we attune ourselves with the divine light or energy of Ahura Mazda while praying to the flowing waters. Avan Yazad is called Avan Ardvi Sura Anahita. Ardvi is the name given to one of the powers of Avan Yazad. It is also the name of a river flowing through ancient Iran. She generally represents all flowing water. She possesses ‘sur,’ weapons, to fight spiritual pollution. Anahita describes the function of the deity, as cleansing physical and subtle contamination. The waters of Ardvi Sura are undefiled and righteous and are the best of all the waters created by Mazda. Thus, the waters of Ardvi are the blessings of Ahura Mazda that descend on earth. “I Ahura Mazda created the powerful force of Ardvi Sura.” (Avan Niyaesh, 7) It is, therefore, considered a great sin to pollute the flowing waters. The Avan Niyaesh and Avan Yasht are the two prayers for attunement with Avan Ardvi Sura. Avan Yasht is Ha 65 of the Yasna ceremony, recited during the culminating rites of the Ab-Zohr, the "offering to the waters." The Avan Niyaesh and the Yasht share many common passages. Ahura Mazda asks Asho Zarathushtra to attune with Ardvi Sura who, cleanses pollution (outside us and within us, such as, ego, greed, passions, Druj) is wide-flowing, (flows through the entire creation in the various forms, divine light in the spiritual world and physical waters in the material world) health-giving, (life-giving) and opposed to the Demons. For the people of the corporeal world, she is a worthy object of attunement and devotion. (Avan Niyaesh, 2) Verse 2 also enumerates the five Fradhos - Adhu-fradho, vanthvo-fradho, gaetho-fradho, khshaeto-fradho, danghu-fradho. Ancient manuscripts reveal a sixth fradho – zantu-fradho. 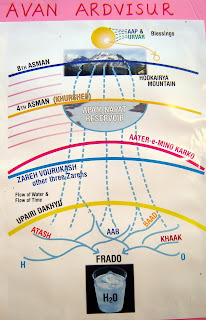 Fradhos are the electro-magnetic forces found in flowing waters. These forces give waters their specific qualities and functions such as giving birth (khshaeto-fradho supplies the force needed to burst the water bag surrounding the baby in the mother’s womb at the time of birth), life-sustaining, cleansing, thirst-quenching, growing food and foliage, aiding digestion, cooking, helping digestion, healing, (the science of hydrotherapy) etc. The Fradhos are more active in flowing waters such as well or spring waters than in bodies of stagnant waters such as pools, lakes, etc. For this reason, well or spring waters are used in the performance of religious ceremonies. In the Yasna ceremony, the performance of the actions and the recitation of the Avesta manthras during the ritual awaken the Fradhos in the water. At the culmination of the ceremony, the priests pour this energized water into the well (this is called Ab-zohr). The energy released into the well water spreads to the other underground sources such as springs, streams and channels thus the good energies are proliferated throughout the earth. Avan Ardvi Sura purifies the seed of all males and the wombs of all females. She facilitates childbirth in pregnant women and provides milk in the breasts of all mothers. (Avan Niyaesh, 3) For this reason, it is a tradition among pregnant Zarathushti women to pray the Avan Niyaesh or Yasht for forty consecutive days. The above verses seem rather strange and need some elucidating. Mount Hukairya and Vourukasha are objects in the divine world, Hasti, and in the non-physical world, Nisti. They must not to be confused with their namesakes on earth. The waters of the allegorical river Ardvi originate in the Hukairya mountain in the spiritual world as Divine Light and collect in the reservoir, Apam Napat, also in Hasti. From the reservoir of Apam Napat, they flow into a huge ocean of energy in the non-physical world, called Vourukash. These subtle waters then enter the material or physical world, Geti, in the form of flowing waters. As the subtle waters traverse the divine, non-physical and material worlds they gradually change their form. The Divine Light gradually becomes denser – spirit being converted into matter - till it appear as physical waters, H2O, on earth. Thus, the flowing waters on earth are the condensed form of the Divine Light of Avan Yazad, which originated in the Divine world, Hasti. As they descend from the divine world to the physical world, the sublime waters of Avan Yazad spread their benevolence through 1001 channels or mediums or agencies. These are depicted as the thousand rivulets and rivers. The number 1001 has a metaphysical significance in Zoroastrian numerology. 1001 can be split into ‘10’ and ’01.’ ‘10’ represents the perfected souls or entities, such as the Yazatas and the Amesha Spentas. ‘01’ represents the imperfect souls and those struggling to attain perfection. The former, with the help of Ahura Mazda’s blessings, will lead the latter to perfection. Each of these channels takes a rider mounted on a swift horse forty days to cross. This is another example of an Avesta statement with deep underlying meanings. A horse indicates spiritual progress. A rider mounted on a swift horse indicates one who is making swift spiritual progress by following the precepts of the Zarathushti religion. Having reached an advanced stage of righteous, this great soul is now fit to ask Avan Yazad for a boon. Through rituals, he attunes himself with Avan Ardvi Sura and makes his request. In the Avan Yasht, spiritually advanced kings and heroes of Iran pray to her and supplicate her for boons. The boons are granted to the good to vanquish the evil in the struggle between good and evil. We too, can supplicate Avan Yazad for a boon by praying the Niyaesh or Yasht for forty consecutive days. This is allegorically depicted as taking forty days to cross one channel. Mount Hukairya is the highest summit of Alborz (a mountain chain in Iran) and Vourukasha, ‘sea with wide shores,’ has been compared to the Caspian Sea. See English translation of Ervad Kavasji E. Kanga, Khordeh Avesta Ba Maeni, p.64 footnote. In the Avan Yasht, in a vivid description, Ardvi Sura Anahita is compared to a fair maid with a strong body, tall, pure and nobly born of a glorious race, wearing: a mantle fully embroidered with gold, four-cornered dangling golden earrings and necklace; ever holding the baresma, bundle of consecrated twigs (Avan Yasht, Kardas 16, 19 and 30). Students of philology conjecture that such personal description of the deity as a comely, alluring maiden is a poetic flight of fancy of the composer of the Yasht. They, therefore, speculate that the second half of this Yasht must have been written much later than the first half! This, they opine, is the same idea as that of the Anahita cult that grew in the West, and from where it was borrowed by the Iranian scribe! Nothing could be further from the truth. Our scriptures abound with words pregnant with esoteric meanings. We shall illustrate this with one example from her description - her wearing the dangling four-cornered earrings. Behind such seemingly simple statements lie the deepest mysteries of Nature. The apparent physical description of Ardvi Sura pertains to the description of her Kehrp (subtle invisible body). The ‘dangling earrings’ refers to the ebb and flow of tides, and the influence and pull of man's fortunes and destiny due to the gravitational attraction of the moon to the Earth. They are ‘four-cornered;’ that is, Ardvi Sura performs these functions on the earth and its environs, which are governed by the four elements (fire, air, water and matter.) The earrings are golden, which means that all these changes and mutations contribute to the advent of Frashogard, the golden age. The above is just one example of how our scriptures are littered with such allegorical and hidden state¬ments. Avan Ardvi Sura is known as the granter of boons. In the Avan Yasht (Kardas 6 thru 20 and 22) great exalted Kings and saints like Hoshang, Jamshid, Faridoon, Kersasp, Kai Kaus, Kai Khushru, Jamasp and even Asho Zarathushtra among others appealed and supplicated Avan for boons. These boons, being beneficial for the universe, were granted. Yet, the boons asked for by Zohak (Karda 8) and Afrasiab (Karda 11) were not considered beneficial, and hence, not granted. 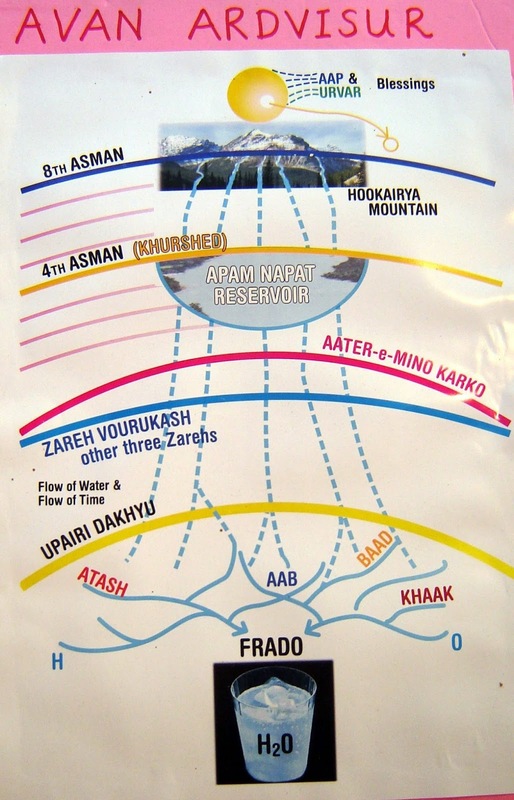 The association between water and wisdom that is common to many ancient cultures is also evident in the Avan Yasht, for here Ardvi Sura is the divinity to whom priests and pupils should pray for insight and knowledge (verse 86). It is stated that libations offered to Avan Ardvi Sura after sunset are excepted by demons. (Avan Yasht, Karda 6, verses 94-95). Thus, prayers to this Yazad are offered only during the three day watches (Havan, Rapithwan and Ujiran) and never in the two night watches (Aiwisruthrem and Ushahin). She is seen to ride a chariot drawn by four horses named "wind", "rain", "clouds" and "sleet" (120). Aredvi Sura Anahita is bountiful to those who please her, stern to those who do not, and she resides in 'stately places' (101). Many Zarathushtis have experienced the benefits of praying the Avan Niyaesh or Yasht consecutively for forty days. The Avan Niyaesh itself tells us of the benefits that accrue by the recitation of Avesta prayers with clear, good intonation and understanding. The reciter attains Garothman behesht (Avan Niyaesh, 17). It is said that if a Zoroastrian can attune with even one of the 1001 channels of Avan Yazad, he attains salvation. Right. There are so many things that are said and to be done. But the actual doing part has to come from within. Once that awareness is awakened than there is no stopping to it.